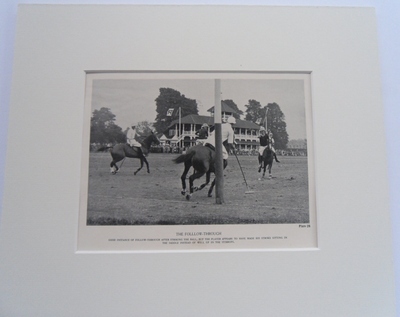 The Follow Through is an instructional photograph from the 1930s at Roehampton. "Good instance of follow-through after striking the ball but the player seems to have made his stroke sitting in the saddle instead of well up in the stirrups. Image size 15cms x 10cms approx. Mounted and ready to frame.